Mark McGhee was understandably delighted at the first home win of the second spell of his Motherwell managerial career. 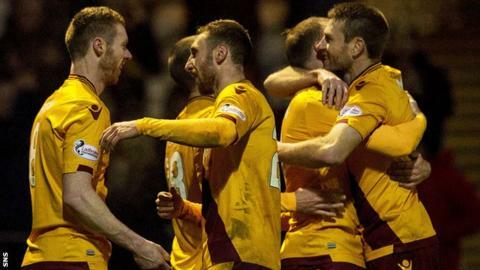 His Motherwell side led Dundee at half-time through goals from Scott McDonald and Louis Moult. Gary Harkins pulled a goal back for Dundee, but Stephen Pearson scored a late goal to secure a 3-1 win. "The first half performance was excellent. We created a lot of chances and scored a couple of goals," he said. "When you lose a goal to go back to 2-1, it's always a difficult one, but I was pleased with all aspects. "For 20 minutes, we had to scramble, but that is going to happen and credit to Dundee." A pleasing aspect to the match for the Motherwell manager was the performance of 18-year-old Ben Hall on his debut. "The young lad was terrific," McGhee told BBC Scotland. "We have been talking about bringing in younger boys and we need to start putting our money where our mouths are. "We put him in to see exactly where he was at and I think he showed that he was ready." McGhee was quick to praise the contribution of Stephen McManus and his presence made his decision to play Hall easier. "Ben can only make his debut because he is playing with Stephen," said McGhee. "He needed that experience alongside him to talk him through it. Stephen did that brilliantly." Dundee manager Paul Hartley was downbeat after the game, lamenting his side's poor opening to the game. "We had a bad start again, giving ourselves a mountain to climb just like the last few weeks," he said. "We didn't start the game well enough and we didn't defend. The goals we gave way were poor." Hartley contended that there was no surprise at the way his side started the second half. "I expected the good start to the second half as the first-half performance wasn't good enough," he said. "I said to the players at half-time that we've got to go and get ourselves back in the game, but you cannot keep starting games like that - there is no doubt about it. "It's not as if we mean to go out and start games slowly."